Yesterday I worked on my new brooch some more. This piece could have been done a long time ago if I would have worked on it alone. Instead I am spreading my time around, spending a little time on it and several other half finished pieces. I don't like to work on a piece from start to finish with out taking some time off to work on other things. If I take time off I can more easily see if I am happy with the design and how it is coming out. Especially with carved pieces. I dwell on small details so long I need to take a break to see the piece is turning out overall. I think its fine to do that, but I think I do it a little too much. I have too many pieces going. Eventually I will finish several pieces all within a short period, but it gets kind of depressing to have not finished a piece in a while, and to have a piece sitting unfinished for a long time. I anodized the parts of my new brooch yesterday. I am not happy with it. I dyed them green, but the alloy I used didn't take the color well. I thought I was using 6061 aluminum, and maybe I was. Maybe 6061 just doesn't take green dye very well. I think I need to make sample pieces of different alloys dyed different colors. I have one big piece of 1" thick aluminum, I have no idea what alloy it is, but I used it for the base of my welder hand piece holder and it anodized great. Anyway I have to remove the anodizing and redo it a different color. The color isn't bad, its just not what I wanted. I really don't feel like doing anything lately. I have several pieces that are almost finished. And there are things I have to make, and things I want to make, but I don't really want to do any of it. I was thinking about learning CAD. I was working with it and learning it, but I got so busy at the end of the summer, and I had my mind on other things, and then I went to Korea and I had so much stuff to do after that. Now I am wondering when the last time I even used it was. August or Sept, I think. Its hard to stay motivated to learn to use it cause CAD just doesn't interest me that much. Maybe if I had access to a CNC mill I might feel more like using CAD. But with out a CNC mill or rapid prototyping machine, I am just making designs that I do nothing with. Designs don't interest me unless I can actually make the piece. I worked on my new piece tonight, but didn't really accomplish much. Then I was about to anodize some earrings and decided they were too thick, so I milled about 1.5mm off the back. They are square, and had carving on the front, so I had to be careful about not damaging the carving. I used super glue to hold them while I milled them. I use super glue quite a bit for milling things like that. 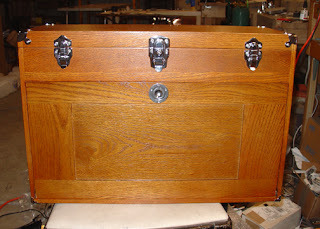 It works so well and I don't have to worry about the vise, or clamps damaging the part. I have to take lighter cuts though. Once I had a part come off and get damaged, but it wasn't anything important. 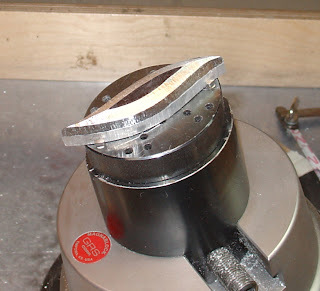 While I was milling I remembered I wanted to make some steel knobs to replace the plastic ones on my mill. So I made one on the lathe, its a little short, I'll make better ones later. It wouldn't have taken long except I had to search to find the tools I needed. After I was finished with that I didn't really do anything else. I felt productive making the metal knob, but it wasn't really since I need to finish pieces, and I don't really need a metal knob for my mill. My customer emailed me and said she received the candlesticks today and is happy with them. I worked on my new piece yesterday, and I decided what I would do with the little parts I made. Its almost done. I have been taking pics of it, but I am not ready to post any yet. I don't like showing my work at such early stages because it doesnt look like much. I'll post the pics when I can also show a finished or almost finished piece. This is an old picture of it, but it doesnt really look much different. I am just working on little things. Thats what takes so much time. 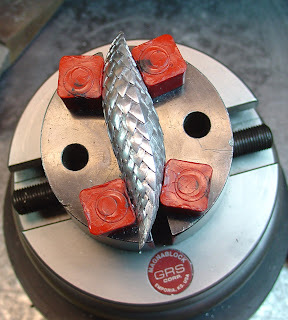 Right now I am almost finished polishing each scale. 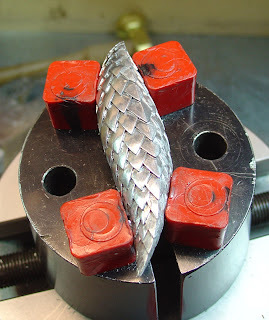 After that is done I will refine the edges of the scales with a graver. 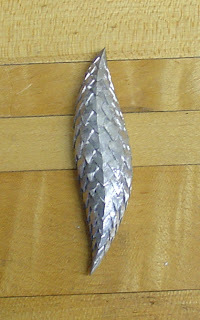 And after that is done, hopefully I will be satisfied and I can anodize it, finish the pinback and be done. This is how it looked when I was first making the shape. I dont have any pictures of it between this step and the previous photo because I often forget to take pictures. I have a lot of photos of work in progress, but very few that show a piece from start to finish. I usually just have random stages of the piece when I would think to take a picture. 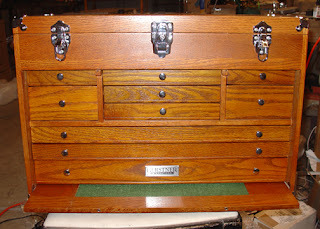 But I am getting better with taking regular photos, because now I have a camera I can keep next to my bench . I got 2 new tool boxes from Sears last week while they were having a sale. It looks like theres just one big box here, but really its 2 toolboxes. The new one is the smaller one on the bottom. The one thats sitting directly on the milk crates. The one on top I have had for a while, and it is full. I took this pic while I was still working on the candlesticks and the studio was a mess. The place looks much better now. In the bottom right of the pic is one of the candlesticks. Saturday I worked on designs for a while then started carving aluminum parts for a new piece. I have a few ideas for these parts I am making, I just haven't decided which idea to use. I would like to try each idea, but these things I am caving take too long to waste them on something stupid, so I have to put some thought into how I want to use them. I finished the candlesticks a few days ago, and I shipped them today. They should arrive Monday. They were very difficult to photograph because of the shiny polished stainless steel and the dark aluminum. And they were almost too big for my backdrop. I think the photos I got will be ok, they just need some work in Photoshop before I can post them. I haven't started anything new yet. I want to spend a bit more time working on some designs before I start my next piece. Lately I think I have not been spending enough time working on the designs. I just start carving something. It turns out ok, but I think the things I am making lately are mostly just variations of the same designs. I want to do something different. I have an idea, but I haven't worked out the details well enough to start. why does everythig take so long? Everything takes longer than expected. I think I will not be able to finish the candlesticks in time to ship them tomorrow. I took some jewelry classes at College or DuPage about 9-10 years ago. I just took them to use the studio there, but I remember the instructor said something along the lines of everything takes 4 times as long as you think, or to multiply your estimated time to finish the job by 4. I don't really remember, but everything does take longer than I expect. 4 times as long might be a bit of an exaggeration, but I need to start taking that into account more when I estimate the cost for a commission. I emailed the organizers of Wearable Expressions to ask if it was a postmark deadline or if entries were due Monday, the deadline is extended. She said entries must be postmarked by Nov 14, instead of Nov 12. So maybe I will have time to finish a piece or two to enter. My studio is such a mess. I will clean it after the candlesticks and wearable expressions entries are done. I have all the pieces anodized for 2 of the candle sticks. I just need to redo a couple pieces of the last one. Then I just need to polish a few parts and put them together. I plan to ship them monday. I have 3 pieces left to anodize. But there may be some that I need to redo. I can't wait till these are finished. Monday entries are due for Wearable Expressions. I have nothing to enter because all my pieces have been entered in other shows. I can probably finish a few things in time to enter it. After that is done I am thinking about making another teapot or some kind of hollowware. Threaded rods and nuts hold them together. The stainless steel tubing is used as spacers for the aluminum. Underneath piece of aluminum are nuts to keep the the whole thing tightly together. At one end of the threaded rods are two nuts welded on that have been cut round on the lathe. In this photo I am making the nuts round on the lathe. In this photo I am using a lathe to drill the hole to hold the silver part the candle will go in. After the hole is drilled I used a boring tool to enlarge the hole to the correct size. This is how the silver piece fits in. I have been working on the candle sticks today. I am anodizing the square ones. I also re anodized the part of my welding handpiece holder. I couldn't get it any darker than before. Actually I think its lighter than before. Theres nothing that can be done about it, except remake the piece in the same alloy as the base, whatever that is. But I'm not going to do that. Its not that important. This is kind of what one of the candle sticks will look like once its together. Its about 24" high. The round discs are 1/4" thick aluminum, the vertical parts are polished stainless steel tubing. The part that will hold the candle is sterling silver, its not in the picture. This one is being anodized blue. This is how I sanded and polished the stainless steel tubing. There were 55 pieces to do. These are some of the polished pieces of stainless steel. I sorted them by size. I tried to put the ones that were close tothe same size together, some of the over sized pieces I had to trim down a bit. I have taped together the pieces of the same size and put them aside for later. I got the book 500 Metal Vessels last week. I like it. I have 1 piece in the book, I just wish it was a better piece. I don't make many vessels so there wasn't much I could submit. I heard from Lark Books about the book The Art of Jewelry: Plastic and Resin. I submitted one piece, the only piece I have made that used plastic, but it didnt get in. Normally rejections depress me, but I don't really care about that one. They said they got so many submissions that they will do one of the 500 series books about plastic and resin jewelry. I also got a letter from Lark about the book 500 Diamonds. They said they didn't get enough entries so they are not making the book. They said they will do a book 500 Gemstones in the future. I worked on the candlesticks some more tonight. I finished anodizing the triangular pieces. Tomorrow I will work on the square ones. I also worked on a hand piece holder for my PUK 2 welder. I am working on the base of the hand piece holder. I have the part super glued to the angle plate. The PUK 2 is the metal box in the background. I really need to make some kind of enclosure for the mill to keep these chips from going every where like they do now. So I finished milling the parts and went to anodize them. Both of the parts are made from different pieces of scrap aluminum, so I don't know what the alloys are. I anodized both pieces for the same amount of time, and used the same dye. The piece on the right I anodized first. The color was very light even though I left it in the dye for almost 10 minutes. The big square piece was in the dye for about 1 minute. I like the color of the bigger piece better. I will redo the smaller piece and try to get the color to match the larger piece by anodizing it longer. I went to SOFA Saturday. It was ok. I can't wait till these candlesticks are finished. I enjoyed making them, except for this anodizing I am doing right now and a few other steps. They are bigger than anything else I have ever made, but I didn't mind. Usually I don't like working on larger pieces. I might make some more pieces in a similar style once these are done. I am not sure what to work on after these candlesticks are finished. I have more commission work to do, but nothing thats due anytime soon. I have a few brooches in progress,and several pairs of earrings I need to finish. I need to work on my scale necklace too, but that involves casting and my kiln is not working. SOFA is this weekend. I don't think I will go. The anodizing went bad for the first candlestick. I will have to re-anodize several of the parts, but I am sick of working on it right now, so I have moved on to the second candlestick. They are coming out better. And while I was anodizing one of the parts, I came up with a new theory as to why I was consistently getting blotches on the same part of the piece. The blotches were always at the top of the part around the edge, I think either the acid or the neutralizer was starting to dry on the aluminum and clog the pores before I put it in the dye. So I am trying to move a bit quicker now. I will see if that helps once I go back to re-anodizing the parts of the first candlestick. I am so sick of anodizing.